Mangaluru, June 12, 2018: State Bank service bus stand is the first thing that comes to the mind when we hear someone say Mangaluru. Most of the people coming from other state and districts arrive here, but the bus stand is always in a shabby primitive state in this ’smart city’ which is the last concern of authorities. The high mast light in the bus stand has blacked out making the whole area dark. Even in the night, there are many travellers at Statebank service bus stand. Also, buses to distance locations come here. Therefore, a well-lit lighting system is essential here. In this backdrop, a high mast lighting system was installed here. But, since some time, the high mast lights have failed to function causing immense trouble, complain drivers and conductors and public alike. Pick pocket-Immoral activity : During the night, illegal activities heighten in the bus stand. There is the fear of pickpocket and immoral activities. If the bus stand is completely covered in darkness, it gives scope to such activity. If someone makes off with money or jewellery, it’s impossible to know who the culprit was. Such incidents have taken place and the staff of the buses here had requested for the fixing of lighting facility. Maintenance absent : 425 buses come to Statebank service bus stop daily. Every bus is charged 35 rupees for the space given for it to stand at. But, there are accusations that the corporation has failed in properly maintaining the bus stand. “Along with the high mast light problem, everything at Statebank service bus stand is plagued with problems. But, the corporation is not responding to this. Also, they have increased the fee collected from every bus single bus by 5 rupees. 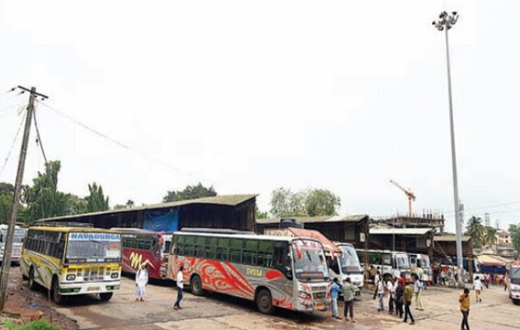 Therefore, we will be submitting an appeal to reduce the fee to the relevant authorities,” said Rajvarma Ballal, President of Canara bus owners association. "Along with the high mast light problem, the entire bus stand is full of potholes filled with rainwater. The bus shelter is completely worn out. Also, the benches for travellers have broken down. Hence, only money is taken and there is no talk about development", he added. “The problem with the high mast lights is due to the rains. We received a complaint in this regard on June 9th and we started its repair work on the same day. Presently, we have replaced its earlier back cable with a new one. The repair work of the high mast lights will be completed on June 11th,” informed Shrikumar, Assisstant Engineer (electrical), MCC.